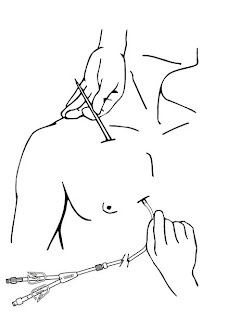 Thank you Sarah for the link to the Hickman, Leonard and Broviac Central Venous Catheter User Guide. This will be the device that will be inserted into my chest while I under go my first round of treatment. Specifically, I beleive mine will be of the Triple Lumen flavor. This thing actually looks quite complicated to insert. It also comes with an entire page of possible complications. Thank goodness that I have Nurse Sarah to make sure they are doing this thing correctly!